New Zealanders of average incomes should migrate to Australia. Okay this is a somewhat provocative statement but vast numbers of Kiwis make this exact decision. And why not? Not only will they typically enjoy higher incomes in Australia they will also pay less income tax. Even if they earn exactly the same equivalent income as what they earned in New Zealand they will find that Australia has a much less onerous income tax system. How much less onerous? Lets have a look. The three tables below do an income tax comparison. For simplicity we can ignored the medicare levy in Australia and the ACC levy in New Zealand as they both modest and roughly the same. 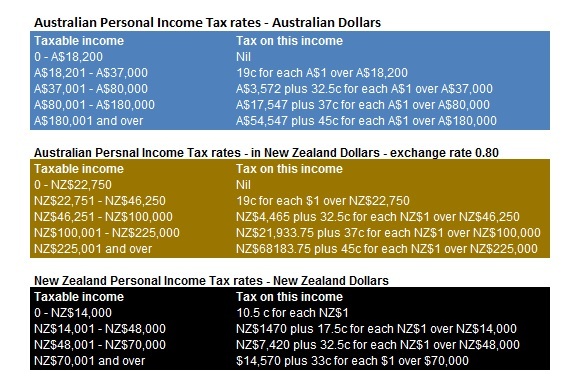 The first and last table show the Australian and New Zealand tax rates respectively. The middle table is the Australian tax rates in New Zealand equivalent currency. The tables assume that an income of NZ$1 in New Zealand is equivalent to A$0.80 in Australia. 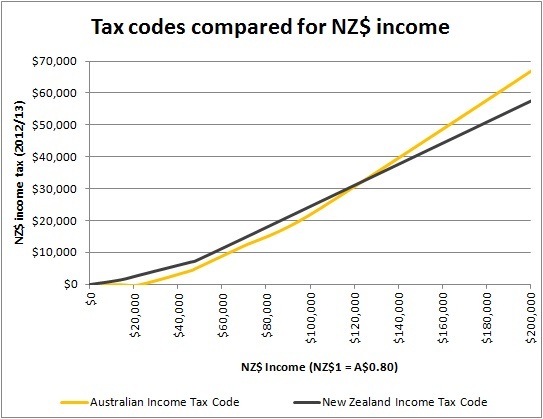 The chart below shows in New Zealand dollars the tax taken for various incomes under the two alternate income tax codes. Clearly the Australian income tax code is far more favourable for people of modest income. The comparison is for tax rates in the 2012/13 financial year. If the New Zealand government wants New Zealand citizens to stay in New Zealand then it ought to reduce the tax rates at the lower end of the income range. The level of debate regarding health care reform in Australia is really rather pedestrian. We should be opening up the health sector to more private involvement and more personal responsibility. We need more price signals on both the supply and the demand side of the equation. However it seems the best we can manage in price signals is a modest tax rebate from the Liberals if you buy private insurance, and a higher medicare levy by the ALP if you don’t. Neither of these is the sort of market price signal we need. We need price signals that link consumers to suppliers. Currently the medicare levy raises about 1/6 th of the amount that the government actually spends on health. If the Medicare levy was meant to raise the revenue needed to pay for Medicare it would need to be about 9%. So if we increased in from 1.5% (there abouts) to 9% and cut income taxes by 7.5% we would still pay the same in taxes (the levy is a tax) but we would have a lot more transparency informing the debate. Each quarter we ought to get mailed a statement from the Medicare office outlining how much expenditure we incurred using our Medicare card. Again this would not change the benefit we receive but it would improve transparency and better inform the debate. If the Medicare statement suggested above was actually an invoice and we were required to repay the expenses we incurred using our medicare card this would allow us to cut taxes by about 9% (inclusive of the current 1.5% Medicare levy or else just the 9% levy suggested above). Given the dead weight cost of taxation this would be real boost to the economy. However there is a social policy concern with this approach that cuts to the heart of why Australians overwhelmingly like Medicare. The cost may deter poorer people from getting treatment. Fair enough. We can fix this concern by allowing people who can’t or don’t pay the invoice to automatically roll the debt from their Medicare invoice onto their HECS debt. In short Medicare would become an income contingent loan from the government. The Medicare card would become an alternate payment system much like VISA or Mastercard but issued by the government and with an income contingent repayment plan. Social concern fixed because nobody is denied essential health care on the basis of affordability. HECS could be renamed to the “Health and Education Contribution Scheme” and still abbreviated as HECS. Okay some people don’t want to burden their future self with such a debt. That is up to them. They can take out private insurance instead or pay as they go using cash. People will vary in their preference but nobody will miss out on medical service due to an incapacity to pay. And insurance could be bought unencumbered by the current prescriptive government rules about inclusions and excess thresholds. Consumer demand and insurance company innovation coupled via the market would allow a process of discovery to determine what health services get paid for by insurance and what get’s paid for via cash. Whether insurance has a small excess or a large excess. Whether we mostly all have the same scheme or if we want a lot of variety. Having reformed the demand side of the equation we should seek to reform the supply side by privatising hospitals. We already have private GPs, private specialists, private medical centres and private pathology services. In fact most routine encounters with the medical sector is already through a private provider. We even have numerous private hospitals. It isn’t a sector that benefits from either government ownership or government operation so we should extricate the government from it and allow hospitals to focus on treating patients and allow governments to instead focus on making better laws. Others have suggested that health care should be provided by governments issueing vouchers which people then use to pay for private insurance. My view is that this approach will lead to governments being prescriptive about what insurance policies must include. About what excess they must provide. They will tend to exclude the option to self insure for some medical expenses. In short I don’t think a voucher scheme would drive the same dynamic process of innovation. Today I attended the Mises Seminar in Sydney. It was organised by new kid on the block The Mises Institute of Australia. The event was very professionally organised, with a well planned agenda, a great venue, a terrific guest list, and brilliant libertarian speakers. As and when they have another such event I would encourage all libertarians to go along and have a look. I met lots of terrific people. When I mentioned my involvement with the LDP I got an unfortuantely too typically libertarian response which is that people would like to join the LDP and vote for a candidate of the LDP if only the LDP was properly libertarian on policy X, policy Y or policy Z. Ironically many of these same people if in America would vote for Ron Paul who belongs to a political party far less libertarian than the LDP. Strange but unfortunately typical. I would definitely hang out at one of these seminars again and I support the effort entirely. However if I was to complain about the lack of libertarian purity regarding the event it would be the obsession of most of the economic speakers with the very unlibertarian idea that fractional reserve banking should be illegal. It is the same idea that turned me off the Austrian school of economics when I first encountered it more than a decade ago. Thankfully they had one speaker, Steve Kates, who did not share this obsession. He kind of saved the day for me. To be clear I do agree with Austrian economists when they say we should abolish central banks. This is a very libertarian proposal. In summary libertarians can disagree on the details but should still work together where they have common cause and find agreement. So vote LDP and also support the Mises Institute of Australia. The prospect of global warming induced by carbon emissions scares a lot of people. There are two reasons why I’m not scared. One is that I think the more alarmist predictions are overblown. The other reason is that I am very much a technology optimist. I think that technological advancement has an enormous capacity to solve most of the problems predicted by the likes of the IPCC. In that article I looked at two interesting technologies. One was the thermal Solar Tower technology being promoted by Enviromission and the other was a battery by a company called Eestor. Four years on I’m less optimistic about these technologies succeeding in the market place and even if they do I’m quite sceptical about them offering any form of meaningful solution toward the global warming issue. However always the optimist I have some new tips to offer. However first I should outline briefly why I continue to discount the hot favourites of wind power and solar power. A lot of subsidies have been poured into wind and solar on the assumption that with scale the cost of production would fall and these technologies would get cheaper. These technologies have in fact got cheaper so the proponents of subsidies can make a respectable case that they have been right. However the problem with this argument is that even as the efficiency of these technologies has improved and the costs of these technologies has reduced there are still scale issues that are in my view insurmountable. Cheaper and more efficient due to the scale of production is arguably a case of global economies of scale. Scale delivers what is known as a learning effect not to mention other cost reduction benefits. However from the vantage point of a single grid there are still massive dis-economies of scale. Converting our grid to 90% wind power will cost a lot more than nine times converting 10% of our grid to wind power. In short dis-economies of scale in grid operation will trump any economies of scale in the production of these machines. In the last few years I have become quite interested and impressed with nuclear technology. It is a solid proven base load power source that can scale. France get’s over 80% of it’s electricity from nuclear power plants. Despite the bad publicity it has an incredibly good safety record as I discussed in my article here called “Safety and Electricity Production“. The recent events in Japan have done little to dent that view. However in spite of being safe and viable nuclear power contributes less than 15% of the worlds electricity. The issue is cost. Nuclear power remains expensive for a host of reasons. Depending who you believe Adelaide has just had some Christians bashing homosexuals, or else some homosexuals engaged in a Christian bashing. Guys – live and let live. Peace and love. If you want to have a bashing session do it in the ring not on the streets.